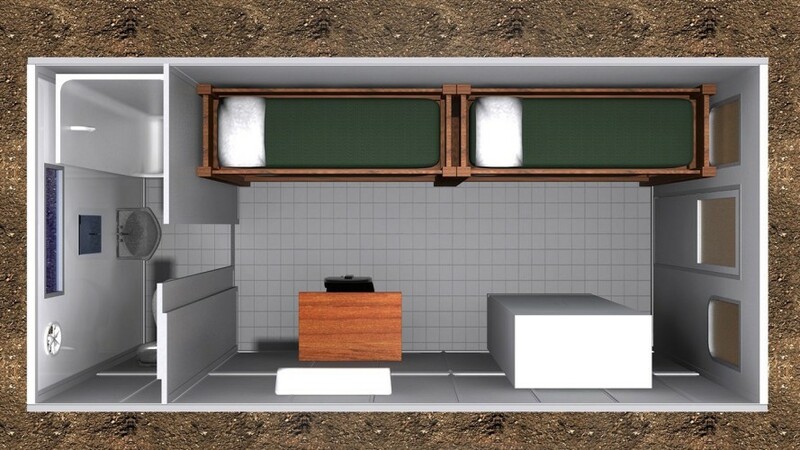 Humanihut is a start-up company from Australia that has developed an all-in-one emergency shelter for refugees and disaster victims that can be set up in only five minutes. The Humanihut refugee shelters are more than just basic housing. Showers, toilets, electricity, and laundry facilities are also integrated into each one. A standard shipping container can hold 16 of the refugee shelters, allowing them to be easily transported and deployed. A “village” of the huts can be built in a matter of hours. Each hut is 22 feet long and 8 feet high. It has solar panels on the roof and wiring for 110 volt outlets throughout. Heating and water purification equipment are also built into each hut, which includes a table, a bench, and a sink. The steel walls and roof are insulated to keep the temperature inside comfortable in either hot or cold weather. The refugee shelters aren’t just portable and quick to set up. They’re also incredibly durable. Each unit is expected to last for up to 20 years, a vast improvement over the tent shelters that many refugees find themselves living in. Not only does the durability of the shelters provide a more comfortable and stable living situation for the refugees or disaster victims, it also helps cut down on costs for aid organizations. An investment in the Humanihut is expected to break even after about 3.5 years, and could potentially save millions of dollars thereafter. In a camp with 50,000 people, the huts could cut costs by $70 million per year. Experts predict that there will be more and more refugees in coming years, as changes in our climate send millions of people in search of food and water. The world needs to provide habitats for dispossessed people that meet their basic need for shelter in a way that preserves their dignity. The Humanihut could be an important part of that solution. Others are also involved in designing shelters for refugees and disaster victims. IKEA has pledged to make 10,000 units of a shelter it has designed available to the United Nations. Designer Abeer Seikaly has also proposed a portable and sustainable tent to house people in need of shelter. Now what the world really needs are effective strategies to reduce the number of people who need such shelters.